Coaches must get athletes excited about learning to dominate the basepaths individually and as a team. As with right-handed hitters, most left-handed hitters stride as the pitch is delivered, although the angle may vary. Baserunning provides the instruction, techniques, and drills for developing essential skills, such as leading, base stealing, tagging up, and sliding. 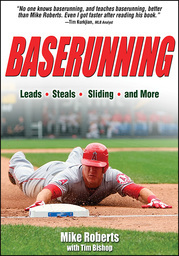 This comprehensive guide provides players and coaches with the secrets and strategies for all baserunning situations.